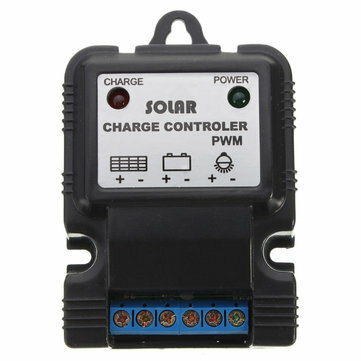 This Solar Charger Controller can automatically manage the work of Solar Panel and battery in solar system. It's widely used for the solar light on street, garden, park, etc. Solar charger controller can control the battery recharging automatically and make sure the batteries work longer and safer. Equipped with device to avoid the overcharge, over release, electronic short circuit, over loading, battery inversely connecting, solar battery inversely connecting. The series connection PWM circuit is implemented to form the major charging circuit, make the voltage loss 50% lower than the diode charging circuit, and the charging efficiency 3%-6% higher than the non-PWM. The LED displayer shows the batteries current situation to make the customer get the information of the batteries. The controller can automatically identify the voltage of 12V. The preparation of the conducting wire:calculate the length of the wire ,and then figure out the installation place,make sure the length of the wire is reasonable to decrease the loss of the electricity. Connect the battery first,pay attention to the anode and the cathode to avoid the inverse connection.the indicator light of the battery willwork if the connection is correct,otherwise,it will not ,but the component of the controller will not be damaged. Connect the wire of the solar panel, pay attention to the anode and the cathode to avoid the inverse connection.if the connection is correct,the indicator light of “CHARGE”will be on or flash 10 seconds later after laying outside under the sun,otherwise,please check the connection.make sure the solar energy panel is laid outdoors under the sunshine. Connect the load at the end,pay attention to the anode and the cathode to avoid the inverse connection .if inverse connection ,the led lamp may be damaged. The batteries has stored much energy,please keep the batteries from the short circuit under any circumstances,we strongly recommend connecting the batteries with the fuse. Please avoid the short circuit wire and the terminal,for the wire and the terminal may generate voltage two times higher than the rated voltage of the controller.Please use the insulated tools while operating the controller. Ensure the children keep away from the battery and the controller. Please comply with the manufacturer`s safety advice.